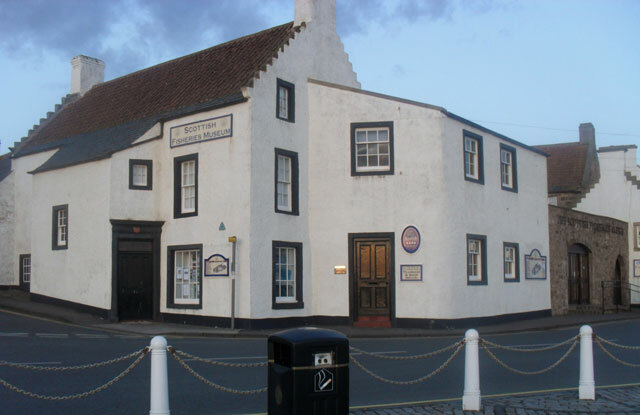 One of the best parts of this project is getting to visit many of Scotland’s wonderful museums, and the Fisheries Museum is one of these. 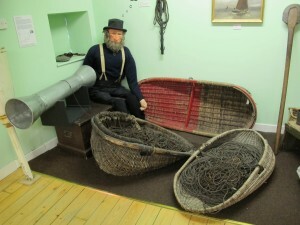 It has a collection of East Coast fishing baskets which is second to none. I’ve been to the museum several times during the project, and it is the key museum for the fishing element of our overlapping basket communities, with a vast range of fishing baskets. Linda Fitzpatrick, the curator, is very knowledgeable about Scottish fishing communities and very supportive of the project. My focus is often on how baskets are made, so Linda’s knowledge and explanations about fishing as a way of life in Scotland over the past 100 years really helps me to understand the way that fishing baskets were used. I’ve looked at the Fisheries collections and photographed the baskets on display. They include an extensive range of long line and short line sculls and baskets, rips, quarter crans and even a Yarmouth swill. On this visit, the plan was to look at the museum’s photo-archive in their library, and view a few baskets from the store. I was very lucky, because both librarians were working the day I visited, and gave me a new ‘line of enquiry’ in the census records. This told me than in 1861, there was one man, Thomas Oliver from Kilrenny, just outside Anstruther, who worked as a fishing basket-maker. That was very useful information, because one of the difficulties with the project is to find by whom and how such baskets were made, the question being, were they made by a few skilful individuals, or did everyone have to make their own? From this information, seems that the former is more likely. My final task was to go through the picture archive in the library. This is another great source of information, especially the ‘Fisherfolk’ section, which has many images of fishwives and fisher-lassies preparing bait and doing their rounds selling fish with creels and sculls on top. Hopefully, a few of these images will appear on this website before too long.